Want proven strategies to consistently beat the low stakes hyper turbos? Feel you could make a lot more money playing hyper turbos, but don’t know where to start? Then this is the book for you! Hyper turbos – or super turbos as they are also called – are all the rage these days in the poker world. They are fast, fun, and full of action. And most of all, they are hugely profitable! That is, if you know the right strategy to play them. This is the first book on Amazon devoted entirely to hyper turbos. If you’re a beginning or intermediate player that wants to improve his game and crush the low stakes hypers, this is the book you should read. This book focuses on 6-max, one of the most popular hyper turbo formats. It also contains a lot of general hyper turbo strategy, so heads-up and 9-man players will find this book very useful as well. Some players have the idea that hyper turbos are nothing but a luck fest. Think again! Sharkscope’s leaderboards show that there are many players making good and consistent profits with hyper turbos. In fact, there are even poker pros who exclusively play hyper turbos for a living. Because the games don’t take that long to finish, you can play a lot more games per hour. Rakeback and volume are two of the main reasons why hyper turbos are so profitable. At the low stakes in particular, opposition is weak and hypers are one of the best games you can play if you want to make money playing poker. This book provides concise and actionable information you can start using at the poker tables right away. It’s easy to read and contains useful example hands that illustrate the various strategy concepts. Also included is an exclusive video course detailing how to play each stage of a low stakes hyper turbo. Ready to find out how profitable the hyper turbos really are? Buy the book and start winning today! The poker books, articles and training videos out there, contain very little information on low stakes poker strategy. This is definitely a missed opportunity because some fundamental strategy adjustments are required to maximize profitability in those games. 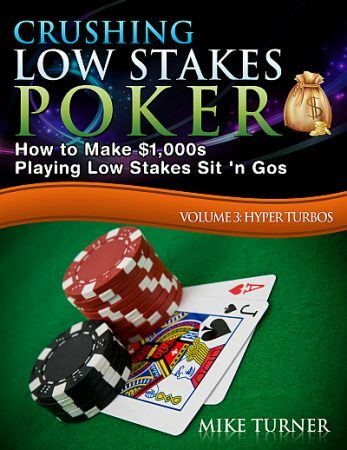 This book intends to fill that gap and shows useful tips and tricks in order to consistently crush low stakes games. Once you’re familiar with the strategies and implement them in your game, you will find that low stakes games are the most profitable kind of games you can play! Hyper turbos, or super turbos as they are also called, are fast and action-packed games. They are one of the most popular formats in the world of online poker today. This will not come as a surprise to anyone who’s ever played them: they are a lot of fun! And best of all, hyper turbos are also one of the most profitable types of games you can play. That is, if you know the right strategy. This is the first book on Amazon devoted entirely to hyper turbo Sit ’n Gos. It contains useful tips and winning strategies for players looking to improve their game. You will learn everything you need to know to consistently beat the hyper turbos and how to make the most money playing these games. The book also comes with a free hyper turbo video course that details how to play each stage of the game. While the focus is on 6-max hyper turbos, heads-up and 9-man players will find this book useful as well. Like the other books in this series, it is aimed at low stakes play in particular. If you’re a beginning or intermediate player that wants to crush the low stakes hyper turbos, then this is the book you need. Part 1 lays the groundwork for being successful in hyper turbos, discussing the fundamentals of hyper turbo play. We will look at things like bankroll management strategies, the concept of SPR, dynamic interpretations of hand strength, and the risk-reward ratio. You will learn more about the nature of hyper turbos and what it takes to be successful in them. Part 3 is all about increasing your profits. Here, you will learn how to read your opponents like an open book and what the single thing is that will crush your competition. Part 3 also contains two exclusive bonuses: a free hyper turbo course you can sign up to, as well as information on how to receive one of the other books in the Crushing Low Stakes Poker series for free. Mike Turner has a lot of experience playing low stakes SnGs and has had great success playing them. His favorite game types are non-turbos and hyper turbos, and he specializes in heads-up and 6-max. Including bonuses and rakeback, Mike has earned more than $25,000 playing low stakes Sit ‘n Gos.